Veterans in need living in Fountain Hills, Ariz. know they can count on the Elks for support. Using an Elks National Foundation Gratitude Grant, Fountain Hills, Ariz., Lodge No. 2846 partnered with local VA hospitals to purchase and deliver household items, books, magazines and movies to veteran residents. 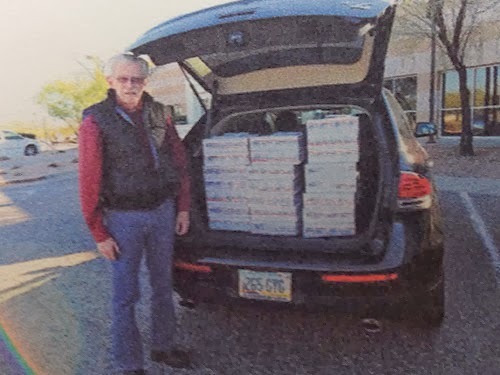 To let active military members know they have the support of the Elks at home and overseas, the Fountain Hills Elks also prepared gifts for those serving in Afghanistan. Thanks to the Gratitude Grant, the Lodge gained seven new members and showed the community that the Elks are there for veterans in need. Don’t miss the opportunity to serve your community with $2,000! Gratitude Grants, which help Lodges like Fountain Hills meet local needs, are available to Lodges that meet National President’s per-member goal for giving to the ENF before March 31, 2014. Click here to check your Lodge’s standing, then click here for more information about Gratitude Grants.